We’re adding a classic noodle to the menu this week that is an international favorite we’re sure you’ll be excited about: Fettuccine. This more dense noodle is incredibly fresh and filling when made with egg-dough like we do at Due’. We’ll be making delicious fettuccine noodles from egg dough fresh every day to serve as a new, hearty base for your favorite sauces. 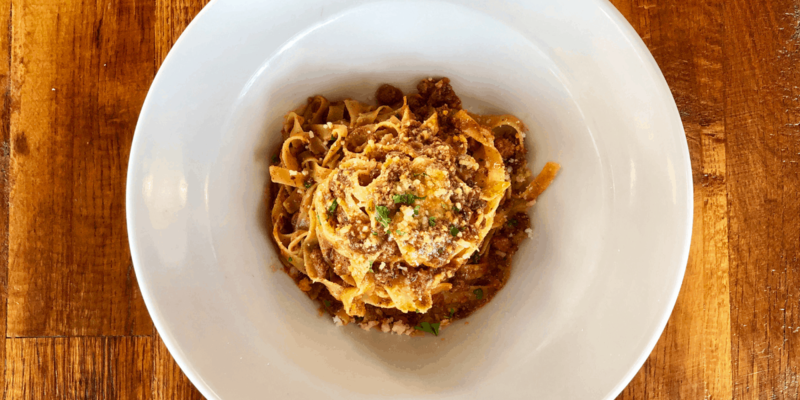 As with most of our favorite, signature dishes here at Due’, fettuccine is a traditional Tuscan and Roman type of pasta. It’s long noodles are characteristically flat and thick and normally made with an egg dough for a fresh, rich taste and texture. Because it’s traditionally made with egg dough, fettuccine is best made fresh and prepared with your choice of sauce right away; like we do at Due’. Often times you’ll see fettuccine noodles curled up in little nests waiting to be cooked fresh or dried. You may see artisanal versions of fettuccine made with spinach along with other various dough colors and additions. Because of fettuccine’s thicker noodle shape, it makes it ideal for holding thick sauces that include meat. We have a few suggestions of our own, as Tuscans, for how to enjoy this super traditional, well-loved pasta shape. Take advantage of this hearty noodle and pair it with a Ragu’ alla Bolognese sauce for a really filling meal. This is the traditional way! Another great option we recommend is lighter white sauces like our Mushroom and Truffle sauce and a simple option of fettuccine topped with smoked salmon for something a little lighter. This is a noodle that serves as the perfect base for your favorite sauce for a rich meal or is also incredibly satisfying all on it’s own with something more simple. It’s versatile and when you’ve had it made fresh like we do at Due’, you won’t be able to have it any other way! Come in and enjoy a fresh plate this weekend.